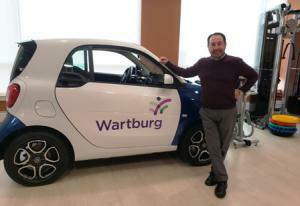 MOUNT VERNON, N.Y.—March 13, 2019—Wartburg, a premiere senior residential and healthcare facility in lower Westchester County, now offers a car for real-life training in its state-of-the-art rehabilitation building. The addition of a car to complement Wartburg’s “Real Life Training” apartment will help patients learn safe transfer in and out of a car—giving them the confidence they need to return to their lives faster and healthier. Wartburg boasts Westchester’s only freestanding rehabilitation center with all private rooms and baths. Part of its innovative rehabilitative care is a “Real Life Training” apartment with a living/dining room, kitchen, bedroom and bath. Patients perform activities of daily living like getting in and out of bed, the shower or taking items in and out of the washing machine/dryer to ensure a safe return home. The car allows for patients to do the same with activities outside of the home that involve using a car. To learn more about Wartburg’s Inpatient and Outpatient Rehabilitation Programs please visit www.wartburg.org or call 914-513-5354. Wartburg, located in Westchester County, NY, offers integrated, comprehensive senior residential and healthcare services. Unlike conventional retirement communities, Wartburg provides a wide range of services to both residents living on its beautiful 34-acre campus and people in their own homes. From independent, assisted living and award-winning nursing home care to inpatient/outpatient rehabilitation, home care and adult day care services, its continuing care approach has earned Wartburg a trusted reputation in Westchester. Wartburg also provides caregiver support at every stage with an array of options to find the level of care that considers the whole family. Wartburg was named one of the "Best Nursing Homes in New York State" by U.S. News & World Report for the eighth consecutive year in 2018.